By Jim Dower: Former featherweight world title challenger Joseph “Jo Jo” Diaz (28-1, 14 KOs) pounded out a one-sided 10 round unanimous decision over the game but limited Charles Huerta (20-6, 12 KOs) on Saturday night in super featherweight action at the Fantasy Springs Casino, in Indio, California. The scores were 99-91, 99-91 and 99-91. Boxing News 24 had it 98-91 for Diaz. He looked strong tonight in winning. This was a good entertaining fight with a lot of two-way action. Although Huerta was over-matched, he gave a good account of himself. He didn’t get discouraged at anytime in the fight despite taking a lot of punishment from Diaz. The fight was an odd one due to Diaz, 26, being close friends with Hueta. Diaz was the much bigger puncher in the fight, and he was landing big bombs. He may have been good friend with Huerta, but he wasn’t playing around. Diaz was connecting with nice jabs and hard right hooks to the head in the early going in the fight. However, Diaz never had Huerto in trouble with his shots. The hand speed and power wasn’t quite enough for Diaz to dent Huerta’s chin. Huerta had been knocked out once in his career in getting stopped in the 1st round 10 years ago in a fluke stoppage loss to Derrick Wilson in 2009. Diaz was trying to get Huerta out of there, but he couldn’t land consistently enough with his best power shots to get him in trouble. The win for Diaz was his second since losing to World Boxing Council featherweight champion Gary Russell Jr. last May in a 12 round decision loss. 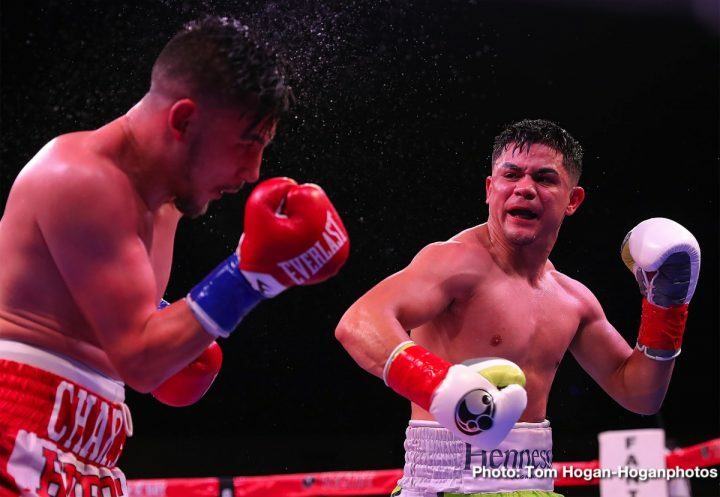 Diaz didn’t possess the hand speed or the punching power to compete with Russell Jr. It’s unclear what Diaz hopes to accomplish in moving up to super featherweight. At this point Diaz perhaps had no other choice but to make the move up in weight, since he was struggling to make weight for his fights at featherweight. At least in moving up to 130, it’s a weight that Diaz can make. The ideal obviously was that Diaz would potentially have more punching power fighting at super featherweight than he did at featherweight. However, that wasn’t the situation tonight. If Diaz is going to beat the top fighters at super featherweight, he’s going to have to beat them by decisions, which is bad news for him because he’s going to have to take a lot of punishment against guys like Gervonta Davis, Miguel Berchelt, Alberto Machado, Tevin Farmer or Masayuki Ito. Lightweight Adrian Estrella (29-3, 24 KOs) defeated previously unbeaten Oscar Duarte (15-1-1, 10 KOs) by a 10 round split decision victory to win the vacant WBC Continental Americas 135 lb belt. The scores were 96-94, 98-92 for Estrella and 97-93 for Duarte.